It can be difficult to place the first collar on some cats, especially kittens or adults that have never worn a collar. Even though the process can take some patience, don’t let the challenge stop you from putting a collar and ID tag on your feline friend. A collar and ID tag may be your cat’s ticket home if she accidentally escapes or wanders off. 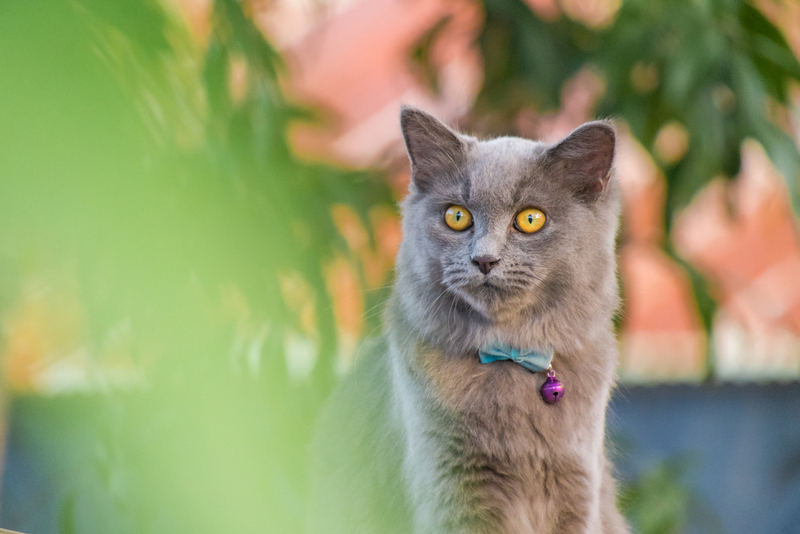 Even indoor-only cats should wear collars, because if your cat does get out, a well-meaning person may think your cat is a stray and take her to an animal shelter. With an ID collar, your cat has a better chance of safely and quickly getting back home. Your cat may scratch at the collar at first, since it feels foreign, but she should adjust to it with time and patience. Try using a tasty treat, catnip toy or climbing post to distract your cat’s attention from the new collar. By the time she finishes the treat, she may have forgotten the collar entirely. You may have to repeat this trick a few times, but stick with it — the benefits are certainly worth the effort. Keep in mind that collars do not expand when your pet grows, and kittens grow very quickly! If not checked frequently and loosened as needed, collars can literally grow into your pet’s neck and cause excruciating, constant pain. Be sure to check your kitten’s collar at least every week until it is full grown, and check your adult cat’s collar regularly to make sure it fits properly and is safely secured. You should be able to easily slip two or three fingers between the collar and your pet’s neck. Cat-safe collars can lose elasticity over time, and as elderly cats continue to age, they may lose weight. Be sure that the collar is not so loose that it could slip off over your cat’s head. Be sure to buy a “break-away” safety collar that can easily come open if it gets caught on something. This will prevent the collar from accidentally strangling your cat. Microchips are an ideal way to provide permanent identification that will always stay with your pet. A microchip is a tiny capsule (about the size of a piece of rice) that is injected painlessly under the animal’s skin between the shoulder blades. Each chip contains a unique ID number that can be read by a scanner and then matched with owner information in a comprehensive database. If you do microchip your cat, be sure to update your contact information in the database if it changes in any way. Microchips do not contain a global positioning system (GPS), so they cannot be used to track your pet. However, they are considered legal proof of ownership in case your pet is stolen.